You'll be £10.00 closer to your next £10.00 credit when you purchase A Goldstar Century. What's this? Number 31 Squadron RAF will celebrate its centenary in 2015; a pivotal milestone for a Squadron engaged at the forefront of military activity for the past 100 years. With a number of events lined up to celebrate this important anniversary, former Commanding Officer of the Squadron, Ian Hall, has set himself the ambitious task of penning the Squadron's entire history, from formation right up to current-day activities. This lively and informative narrative is interspersed with first-hand accounts taken from interviews conducted with the men who made/make up the Squadron. The first twenty-five years of the Squadron's history were spent on India's North-West Frontier, hence the Squadron motto 'First in the Indian Skies'. During the Second World War, it was occupied mainly in the Middle East and North Africa, before moving to the Burma theatre for the remainder of the war. Upon returning to the UK in 1948, the Squadron performed communications duties until, in 1955, it joined the Cold War in West Germany, operating successively in reconnaissance and strike/attack roles. Operational deployment in recent years has seen the Squadron deployed during the Gulf War, the Iraq War, in Kosovo, and Afghanistan. With troops pulling out of Afghanistan in 2014, 31 Squadron have now completed a circular history, and there seems no better time than now to commit it to print. Each and every facet of this long and varied history is relayed in a style that serves to provide an account that is at once celebratory and objective when it comes to recording not only the facts of the various deployments but also the personal stories of the men behind the headlines. ... This is an excellent history of an interesting squadron. The history of 31 Squadron over the past 100 years is written by Ian Hall, ex-Jaguar and Tornado pilot as well as former Commanding Officer of 31 Sqn. He is the author of Jaguar Boys as well as the editor and writer of the Squadron Association's newsletter, so speaks with authority about the 100 years of 31 Sqn. 31 Sqn have spent 78 out of the last 100 years overseas, which apart from almost certainly being a record, has given them a fascinating history. As long ago as August 1919 they were involved at the end of the Third Anglo Afghan War, and since the squadron were also deployed in that area this century, it serves to show how difficult is it to solve human conflict in certain parts of the world. The front cover showing a BE2C and a pair of Tornado GR4's illustrates the time span well. Anyone with a sense of history will be interested to read how 31 Sqn, equipped with Dakotas, took part in the airlift of civilian refugees during the Indian Independence/Partition period in 1947. Wherever there is conflict, you will find refugees. The book boasts high quality paper with many good photos, and is a very good read. 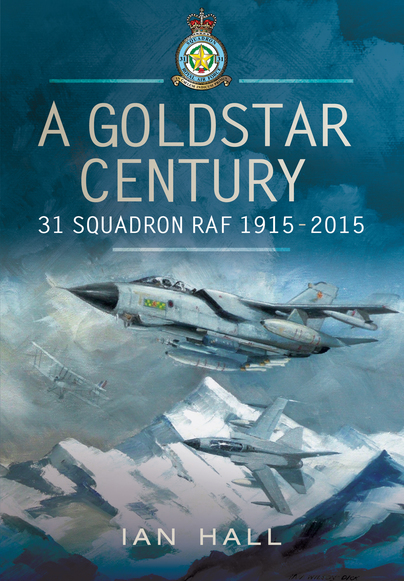 Goldstar Century presents 31 Squadron's history in an objective style and closes the circle by documenting its most recent operations in Afghanistan. This lively and informative narrative is interspersed with first-hand accounts taken from interviews conducted with the men who made/make up the squadron. A detailed history of 31 Squadron, which marked its centenary in 2015. The lively narrative is interspersed with first-hand accounts from past and present personnel from the unit. Considering the large numbers of sorties flown by, for instance, No 31 Sqn's Dakotas in 1944 or its Tornados on Operation TELIC in 2003, we are presented with first-hand accounts of only a relative handful, but I was left with a very clear impression of life on the squadron at the time. It is also necessary to lighten the tone with personal recollections focusing, in particular, and frequently, on aspects of squadron life other than flying and fighting. It is a balancing act and 'A Goldstar Century' does it extremely well. The result has been to create an impression of 31 Squadron as a 'family' with continuity ensured by an active Association to which the author often refers and whose contribution he repeatedly acknowledges. Ian Hall is a former Commander Officer of No. 31 Squadron (1992-4), as well as being the editor and writer of the Squadron Association's three-times-a-year 32-page newsletter. He is the author of Upwards, an aviation-themed novel currently available as a Kindle download. This is his first full-length historical study, having previously penned a 80-page history of No 31 Squadron's early Tornado years.